Made of top quality materials throughout, the Artisan® Premium Disc Holder features a firm rubber backing pad layered with thick soft foam and hook-and-loop face that make it tough and dependable while providing the flexibility you need. Comments On Mar 30, 2016:Really holds the sandpaper disc well, flexes well to get the inside of bowls. Wish the tang part gripped by the drill chuck were maybe a 1/4" longer, but it's not really a problem. Best I have found so far! Comments On Oct 20, 2013:Well designed disk holder with an aggressive hook and loop holder. Gets a daily workout in my production turning. I use and abuse them and, like that proverbial bunny, they keep on running. Get yours here! Comments On Oct 25, 2012:This is a great hook and loop disc holder for the money. 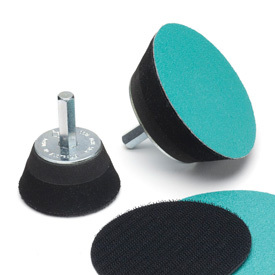 It provides great support while sanding and is much more durable than other disc holders on the market. The velcro pad is great quality and holds the discs firmly. Definitely replacing my other disc holders with these.